Books build bridges without borders – all over Europe. with a new key literary topic each year. Authors from whole Europes meet in Saarbrücken. 150 readings covering a wide literary spectrum are held over three days at unusual venues. This is where languages can converge without borders. Authors read in their native tongue accompanied by foreign language students from Saarland University and actors from Saarland’s State Theatre. 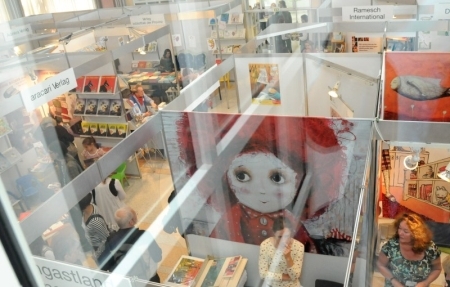 European publishing houses of children’s books join together at round tables. Trade visitors come into contact with publishing houses and authors.We build bridges between cultures, between generations. 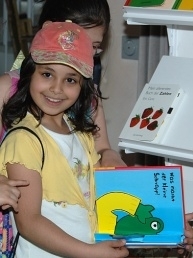 „Books build bridges“ is the permanent motto of the Europäische Kinder-und Jugendbuchmesse – the European Children’s Book Fair. All over Europe it builds book bridges without borders between cultures and generations to promote education, tolerance and to inspire the imagination in a globalized world. A new group of European guests of honour and new key literary topics each year, together with the meetings presenting authors from the European countries involved and 146 readings over three days, bring the bridge-building metaphor for this fair to life. The fair is an authors‘ fair and communication platform for publishing houses, authors and trade visitors. In Saarbrücken they come into contact with the young inquisitive and interested minds of its public. The fair provides comprehensive information on new publications and on current and innovative trends in the German-language and European children’s book market. In so doing, it remains true to its principle, to make the presentation and conveyance of literary quality in the children’s book its priority task. Early childhood education has always been one of its greatest concerns. In this respect, the fair is particularly interested in addressing parents and grandparents as well as childcare workers and teachers. Right from the very beginning, these people have an influence on what children and adolescents experience and learn. This is especially true of the youngest, who have an insatiable curiosity and a great thirst for knowledge, making them the „young explorers and discoverers of the world“. This joy of discovery should stay with them all their lives and the book fair provides the impetus for this. That is why publishing houses and institutions offer parents and grandparents a wide range of baby books and first reader texts, reading games and educational books on their stands, where professional advice is also close at hand. Incentive programmes for childcare workers, teachers and parents give methodological tips and ideas. The Academy for Young Explorers concentrates on the educational book and invites participants to professionally supervised workshops on subjects related to the respective key literary topics of the fair. In the run-up to the fair the exhibition taking place in the famous K4 gallery displays original illustrations by international artists from current picture books, encouraging visitors to immerse themselves in a colourful and exciting world of images. Visitors can take a break from the fair crowds in the small, cosy reading nichesand in the marquee lounge on the castle forecourt. Book bridges between generations are an important mainstay of this fair profile. During the Family Weekend visitors can look forward to a varied programme with readings, discussions, meetings, theatre, film and workshops. Particularly popular to start the visit to the fair is Sunday breakfast in the literature café. The fair bookshop offers many books, especially those written by the guest authors, for sale.